The Intersections & Beyond: Toblerone Photo Competition ---> Extended till Nov. 10, 2009! Toblerone Photo Competition ---> Extended till Nov. 10, 2009! This contest has been extended till NOVEMBER 10, 2009 (Tuesday) at 5pm. Don't worry, you can still submit your entries! :-) How does that sound? When somebody shows us goodwill, what is usually our reply? When somebody extends to us a helping hand, what words do we reciprocate this action? When someone gives us encouraging words, prays for us, shows concern, asks us if we're okay, how do we acknowledge this nice gesture? When our friends remember our birthdays, treat us for an occasion, give us gifts or greeting cards, how do we show our appreciation to them in words? When God answers our prayers, or even responds to us telling us to wait or something is not really meant for us, what short response do we give Him? It is "Thank You." These are two words ever easy to utter to show our appreciation and gratitude, to acknowledge a good work or deed, to be indebted to someone, to show courtesy, to praise and worship God, to bow down before Him, to receive blessings, to return a favor and also to bless others. Thank You is such a powerful statement that one should never neglect of saying or doing. I thank God for the blessings, for the life, for family and friends, for art that continues to inspire me and ignites my passion every so often, for books that enlighten me, for music that soothes my soul, and for the lives of others that ennoble. 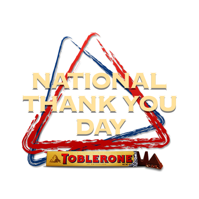 Toblerone is sponsoring a National Thank You Day in the Philippines now on its 3rd year. In line with this, my blog site is hosting the "Spread the Sweetness of Gratitude Photo Competition." This photo contest is open only to all Filipinos of legal age living in Greater Manila Area (Metro Manila, Bulacan, Rizal, Antipolo, Cavite and Laguna). 1. Take a photo that shows a fantastic and creative way of saying "Thank You" or expressing one's gratitude. The photo must be the participant's own original work. Plagiarised entry will be disqualified. 2. Participants must post their entries in their own website (blog site, Multiply, Friendster, Facebook, etc.) and write a Short Caption below the photo to describe it. Words can be in English or Filipino. 3. Think of a creative Title for your entry. Words can be in English or Filipino. 4. Link the photo entry to the gallery found in www.thankyoudayphilippines.com. 5. The link must be submitted to this blog as a comment to be considered valid. Please make sure that the link is working and that the link can access your entry. Include also your full name & a valid email address to be notified of the status of your entry in case you win. 1. From all the entries submitted here, five (5) will be selected as Finalists. 2. The Top three (3) Winners over-all will be selected by a panel of judges. 3. Winners and Finalists will receive a Toblerone gift pack each, and will be acknowledged in the National Thank You Awards. Your name will also appear in various print and online publications. Who knows - there might also be some surprises from the sponsors. What are you waiting for? Join now! Hi ALVIN & MAVEE: Kindly add your URL site & email address. Thanks! Those who submitted entries on the THANK YOU website but did not submit the links here as COMMENTS will not be honored, and therefore disqualified. Please follow the instructions completely, as stated in the MECHANICS. Thank you! Hi Raymond. Thanks for dropping by and leaving a comment. :) Please visit again.